Food supplement contains: 100% naturally sourced food grade Diatomaceous Earth from a rich fresh water source. INSTRUCTION FOR USE: Mix 1 teaspoon of this food supplement with any liquid and drink 1-2 times a day. Food supplement does not substitute healthy lifestyle. Supplement complements a varied and balanced diet and a healthy lifestyle. 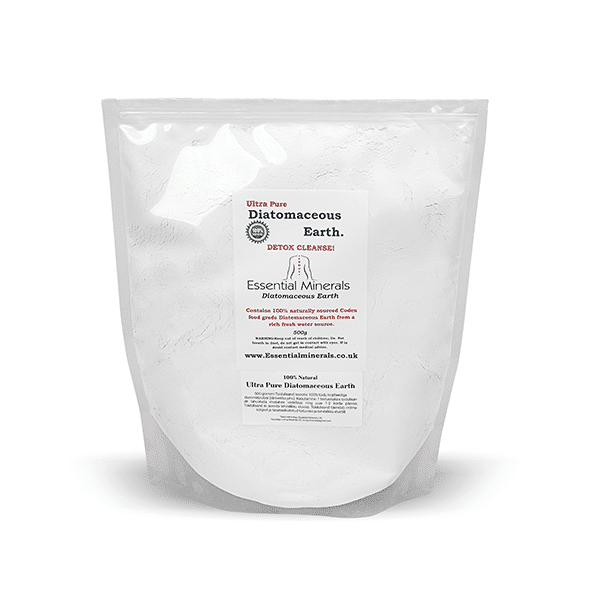 Food grade diatomaceous earth (DE) is a gentle abrasive that’s also highly absorbent. DE is almost entirely made of silica, an important component of human ligaments, cartilage, and musculature. This unique resume makes DE one of the cheapest and most versatile health products on the market. DE works as an amazing supplement; there are a couple of main reasons for this: 1) DE helps move things out of your intestines and 2) helps promote healthier hair, skin, bones, and joints. Take DE on an empty stomach. We recommend starting small and slowly working your way up to a higher dose; begin with a teaspoon added to at least 12 ounces of liquid. Mix vigorously and drink immediately. Some people don’t like the chalky flavor and gritty texture that are typical of DE mixed with water. If that describes you, try adding DE to a drink with more flavor (milk, orange juice, coffee, smoothies) or to foods like yogurt, oatmeal, or applesauce. You may experience your body responding to the detox effects of DE. Counteract these by increasing your fluid consumption. The part of DE that our bodies absorb is actually a primary ingredient in many of the over-priced hair supplements at your local pharmacy. If you have thinning hair you can begin to see new hair growth in just a few weeks. Collagen, another fundamental building block of healthy skin, production is helped by the presence of silica from DE. That extra collagen will make your skin smoother and fuller, keeping that healthy look. DE’s silica is not only an essential component of hair, but it is essential to having strong nails. So if you have nails which are brittle, take some DE to see them get stronger in just a few weeks. DE can actually help create more regular bowel movements and detox your digestive system. Increased collagen production supports healthy digestion allowing your body to absorb more nutrients and flush out more unnecessary waste. Looking to lose some weight? Collagen helps support a healthy metabolism which can help you manage your weight when combined with diet and exercise. Collagen helps promote joint health and can reduce joint pain over time and strengthen the cartilage that cushions our joint movements. Studies have also shown that DE, when taken daily, can help promote healthy cholesterol levels and blood pressure.